LCD and LED digital display screens are the most efficient way to broadcast fast changing travel information and arrival and departure schedules to passengers in the public areas of transport hubs such in airports, ports, train stations, bus and coach depots, ferry terminals, etc. Sam Russell, Communities and Stakeholder Manager of Arriva Rail in London explains a recent challenge to improve the information provided to train passengers about other public transport options near their train stations. 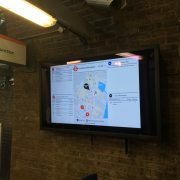 ‘What we were looking for was a solution that would help us to present this information on a safe, robust and easily installed digital display screen, in a suitable location on the station where it was clear and visible. 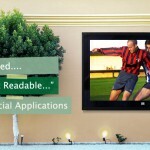 We decided to install Aqualite’s IP66 digital display screens because the product was an excellent fit for our needs, in terms of protection from the British weather and display quality. Also the display screens were quickly and conveniently available. 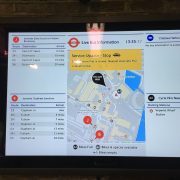 Kim Menen of Aqualite Outdoor added, ‘Our 1p66 rated electronic screens offer the best display solution for train and underground station digital signage networks. These high visability screens can withstand all weathers and can be used to broadcast train timetables and directions at the entrance, in the ticket hall or passageways and on the platforms.